The Samsung UA32J4003AK 32inch HD Flat LED TV will be a great addition to your home entertainment system. The television features a 32inch LED panel that lets you view content at a high resolution of 1366 x 768 pixels. The television has a Clear Motion Rate of 100Hz that lets you view every frame of any video clearly without experiencing any blurriness. It features two HDMI ports and one USB port, both of which let you connect a variety of devices. The television is slim and is available in an indigo dark blue color that gives it an enigmatic look. This Samsung LED TV features a 32inch LED panel that offers a resolution of 1366 x 768 pixels for providing an unforgettable viewing experience. The television is equipped with two down firing speakers that provide crystal clear audio output. Convert your home into a theater and enjoy your favorite flicks in HD resolution. 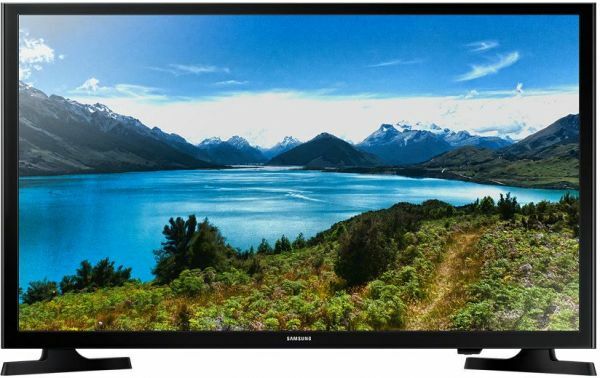 The Samsung 32inch HD Flat LED TV includes a feature called Wide Color Enhancer. This feature enhances the quality of the coloring of the image and reveals hidden details. This results in you getting to view the image in its true form, with all its details intact. Transform your room into an entertainment zone with the Samsung 32inch HD Flat LED TV that features two HDMI ports to let you connect a variety of HD playback devices. The HDMI ports enable you to view content in High Definition by facilitating the transfer of uncompressed video data from other media devices. This TV also features a USB port via which you can view content from pen drives, portable HDDs or even your smart devices.